Hi Everyone! Today I have the fabulous Jennifer Brown on the blog! Not only is this girl freaking hilarious, she’s written an amazing debut novel. I can say this because I’ve read it, and it’s fantastic! Critics are raving, I swear. So . . . after you read this interview, you should head on down to your local bookstore and pick up a copy. This is one that will stay with you for a long time. Jennifer Brown is the author of HATE LIST, a YA novel coming out in September 2009. As a two-time winner of The Erma Bombeck Global Humor award and weekly columnist for The Kansas City Star, as well as Saturday Featured Blogger for Mom2MomKC.com, Jennifer spends a lot of time dressing up her dog for laughs and thinking of new ways to works words such as "Puh-lease" and "Ch-yeah!" into sentences. Jennifer grew up in the Kansas City, Missouri area, where she still lives with her husband, three kids, and whole herd of uncooperative pets. Jennifer: I had the most fun writing the therapy sessions with Valerie and Dr. Hieler. The doc is really kind and caring and smart and intuitive, but he's also kind of a jokester. The scenes felt nice and light to me, and a way for Valerie (and the reader) to take a breath a bit. Me: He was great! He definitely worked to get Valerie back on track. What kind of writing projects are you currently working on? Or, if you aren't working on anything new, is there a different demographic/genre you wouldn't mind tackling in the future? Jennifer: I'm currently working on another YA novel. It's going to have a similar feel to Hate List, but is, of course, about an entirely different subject. I'm also working on a women's fiction project. That's the genre I started writing in, and I sometimes miss the lightness of it. Jennifer: Oh, I have so many! No fair making me choose one! Probably the one who pops into my head first would be Maya Angelou, because her writing seems so brave and lyrical... it's like every word was agonized over before being chosen. There's not an "and" or "the" out of place. And when she speaks... it's like every syllable is important. You know the phrase, "I could listen to her sing the phone book?" Yeah, I could totally listen to Maya Angelou read the phone book... and would come away feeling like a better person afterward. I’m finally back in town after my trip to the SIBA (Southern Independent Bookseller’s Alliance) Trade Show in Greenville, SC. Long drive (which I shouldn’t complain about since technically I was chauffeured by the guy I’m sorta married to but not allowed to talk about online). Great hotel (I mean, it’s always a good thing when you can see your reflection in gold in the elevator. I’m so spoiled. Again, thanks Dude!). Fabulous signing! Thanks again, Dave, for getting such an awesome event together! A lot of booksellers seemed excited about One Wish, which is always a good thing. AND . . . in the hour before my signing, guess what I managed to snag? I swear, perks of the job: free Advanced Reader’s Copies of books that haven’t even hit stores yet. It doesn’t get much better than that. 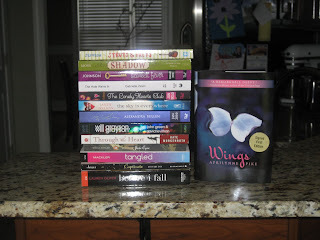 AND, as if that wasn’t freaking awesome enough, I managed to score a SIGNED FIRST EDITION of Aprilynne Pike’s WINGS. Signed. First. Edition. I was actually going to buy it, because I knew it wasn’t free. Turns out Harper was going to give them away Sunday. When I mentioned that Aprilynne and I were both 2009 Debs and I thought she was fabulous . . . the Harper Rep handed me a copy. Of course, I told her she didn’t have to do that (while I was squealing on the inside), but she insisted. SO Sweet! My new best friend, really! So . . . it was a successful weekend. I had a great time signing, and indie booksellers: You know you’re Awesome! Can’t wait to sink my teeth into all these amazing books! In the meantime, I have to work the rest of the weekend to catch up (since we left Friday), and baby girl brought home a nasty cold from SC. More than halfway through first round revisions on the WIP! Still plugging away! Today I’m happy to have Kate Messner on the blog! Kate is celebrating the release of her new novel: The Brilliant Fall of Gianna Z! Kate Messner grew up in Medina, New York and graduated from Syracuse University’s S.I. Newhouse School of Communication with a degree in Broadcast Journalism. She worked as a television news producer and reporter in Syracuse, NY and then Burlington, VT, before going back to school to get a teaching degree. These days, Kate is a National Board Certified middle school English teacher. She has helped hundreds of kids work on leaf collection projects and likes sugar maples and catalpa leaves the best. Kate lives on Lake Champlain with her husband and kids and loves spending time in the woods. Kate: I loved writing the scene that takes place on the Robert Frost Interpretive Trail in Ripton, Vermont. We spent a glorious fall day hiking there during my research, and writing that scene was a joy, not only because of the fun I had describing the trail but also because of what that setting brought out in my characters. Me: Sounds magical! I *love* that kind of writing research: it’s the best! What kind of writing projects are you currently working on? Or, if you aren't working on anything new, is there a different demographic/genre you wouldn't mind tackling in the future? Kate: I'm working on revisions for my next middle grade novel with Walker/Bloomsbury. SUGAR ON SNOW is about a girl from a small-town maple farm who earns a scholarship to figure skate with the elite in Lake Placid. It will be published in Fall 2010. Me: YAY! You’re definitely keeping busy! Finally: who is your writing hero and why? Kate: I have a bunch of writing heroes - including many of my friends on LiveJournal who keep me going every day. I love the writing community here. Other heroes? Laurie Halse Anderson and Jane Yolen, both of whom are kind, wonderful people and incredibly diverse in their writing talents, too. Me: I *adore* my LJ friends, and I totally agree about Laurie Halse Anderson. She’s fantastic! Thank you so much for stopping by, Kate! I just wanted to take a moment to say that I had a fabulous time at my signing at Page After Page in Elizabeth City this past weekend! If you’re a bookseller/author and will be at the Southern Independent Booksellers Association (SIBA) trade show/meeting this weekend in Greenville, SC: I will be signing at the WestSide Booth on Saturday. Hi Everyone! I have another Debs post for you! Megan Crewe stopped by to talk about her debut novel: GIVE UP THE GHOST. Cass McKenna much prefers the company of ghosts over "breathers." Ghosts are uncomplicated and dependable, and they know the dirt on everybody... and Cass loves dirt. She's on a mission to expose the dirty secrets of the poseurs in her school. But when the vice president of the student council discovers secret, Cass's whole scheme hangs in the balance. Tim wants her to help him contact his recently deceased mother, and Cass reluctantly agrees. Like many fiction authors, Megan Crewe finds writing about herself much more difficult than making things up. A few definite facts: she lives in Toronto, Canada with her husband and two cats (and does on occasion say "eh"), she tutors children and teens with special needs, and she has yet to make friends with a ghost, though she welcomes the opportunity. Megan: I pretty much love any time Cass and Tim are interacting, particularly the scenes at his house and at the end. Megan: Right now I'm working on a YA urban fantasy novel. Considering dipping my toes into historical and science fiction in the future. Megan: Roald Dahl. He managed to write books that are silly and bizarre, but also deeply moving (consider DANNY THE CHAMPION OF THE WORLD and the end of THE WITCHES), and his world-building and eye for detail was amazing. Thank you so much for stopping by, Megan! This is just a quick note to let you know that I’ll be reading/signing copies of One Wish tomorrow (Saturday, September 19th) at Page After Page Bookstore in Elizabeth City (NC). I’ll be hanging out at the store from 11:00am-3:00pm, so stop by if you’re in the area (or don’t mind the drive!). Fact #1: Whenever I’m nervous, I talk way too fast and tend to ramble on and on and on about nothing. Then, when I leave, I think of a million things I should have said, shouldn’t have said, or should have said better. I just spent a fabulous day at the zoo. My fact for this Friday: Gorillas kind of creep me out. Four little words written in lipstick mean Emily must say goodbye to everything she knows. Emily Carson has always been a good girl. So when she throws a party the night her parents leave for vacation, she's sure she'll get busted. What Emily doesn't know is that her parents will never return. That their plane will go down. And the only thing left amidst the wreckage will be a tray table with the words: “Emily please forgive me” scrawled in lipstick - her mother's last words. Now it's fall in New York City and Emily's trying to pick up the pieces of her shattered life. Her public tragedy captures the attention of more than just the media - and soon two very different boys at her new school are pursuing her: the cute, popular Owen, and the quirky chemistry partner slash pastry-baker-by-night, Anthony. But even with such delicious distractions, Emily can't let go of her mother's mysterious apology. Does she have the courage to face the truth? With help of a whole new kind of family - one that includes a make-up artist to the stars, a teen hand model, and a wacky hairdresser - Emily must choose between the boy who makes her forget it all, and the one who encourages her to remember, and ultimately, heal. Jennifer Jabaley was born in New York and raised in Bridgewater, New Jersey. She graduated from James Madison University with a degree in chemistry and received a doctorate from Southern College of Optometry. A part-time optometrist and mother of two, Jennifer began writing her first novel after a phone call from her sister sparked an idea for a story that lingered in her mind and stirred her creative juices. LIPSTICK APOLOGY will be released in August of 2009 by Razorbill. Jen lives in Blue Ridge, Georgia and is currently at work on her second book. Ambitious, Right? I envy her! Jennifer: My favorite part of LIPSTICK APOLOGY is the end. It's sort of cheesy but I love it. Someone told me the ending reminded them of "A Wonder Years" episode and that to me was a huge compliment. Me: That is a compliment in the highest form! I loved the Wonder Years! I loved the ending of LA, too! What kind of writing projects are you currently working on? Or, if you aren't working on anything new, is there a different demographic/genre you wouldn't mind tackling in the future? Jennifer: Actually I am crossing into a new genre: I'm working on an adult chick lit novel. I've finished my first draft but have lots of work still left to do! Me: That is awesome! Good luck! And finally: who is your writing hero and why? Jennifer: Hmm, that's tough. I'm going with Judy Blume for many reasons. First, she and Beverly Cleary were the first authors I really fell in love with. I devoured their books! But I think Judy Blume is amazing because after all these years her novels still touch upon universal themes of a girl's coming of age. And she really pushed the limits when at that time in publishing many authors were playing it safe. She's been an advocate against book banning and I respect her for that work. It comes highly recommended by yours truly!! I did not remember this—at all. But once she mentioned it, yeah, I have a vague recollection of hoarding a tub of Chocolate Betty Crocker icing in a bathroom drawer. For a late-night chocolate fix, I guess? Who knows? I saw a fantastic movie last night. I don’t think it was in theaters; as far as I know it went straight to DVD. Still, it’s a “Hot New Release” at Blockbuster, and I highly recommend it. They’re calling it a “Romantic Comedy,” but there’s some drama mixed in, too. Seriously: there are some “laugh out loud” moments, and some times you might need a tissue, which is the perfect combo, in my opinion. There are some quirky moments: you have to employ a bit of imagination, but love stories don’t get much better than this. And really, I could think of worse things than staring at James Franco for an hour and a half.